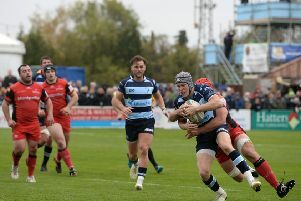 Bedford’s Director of Rugby Mike Rayer makes a handful of changes to the team that overcame the Dragons last week with Matt Gallagher, Pat Tapley and Tom Farrell starting in the backs while Justin Blanchet comes in at flanker in place of Josh Buggea who took a knock during last week’s win. Starting Line-Up: 15. Matt Gallagher; 14. Pat Tapley; 13. Tom Farrell; 12. Tom Griffiths; 11. George Perkins; 10. Myles Dorrian; 9. Tom Whiteley; 1. Camilo Parilli-Ocampo; 2. Sam James; 3. Christian Judge; 4. Mike Howard (c); 5. Will Carrick-Smith; 6. Ed Taylor; 7. Justin Blanchet; 8. Jason Hill. Replacements: 16. George Edgson; 17. Jack Culverhouse; 18. Dave Spelman; 19. Byron Hodge; 20. Hayden Thompson-Stringer; 21. Tom James; 22. Jake Sharp.